I think J. Crew was spending too much time with nail polish remover to notice my recent rant. Sadly, they have done it AGAIN! 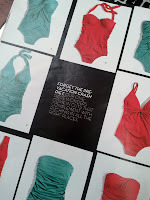 Although I would usually order one of these pretty bathing suits, I refuse. How can I buy a product from a company that tells me I need to have less of me or cover my body up!?! I can’t give my money to a company promoting the idea that dieting = permission to be an uncovered me. Just to spite them and all the other bad body image promoters, I will be wearing a 2 piece bathing suit sans dieting all summer. The Wedding Dress & Weight Loss Does Not Equal Happily Ever After!